A giant volcano spewed a column of ash more than a mile into the sky after it exploded more than three times yesterday, as the Mexican government warns of an imminent eruption from towering Popocatepetl. The 5,462m volcano, just 45 miles from the capital Mexico City, started erupting on Tuesday and agencies have now warned the public to stay at least 7.5miles away. A column of ash soared roughly 1.24miles into the sky at 4.48pm local time yesterday. Mexico's centre for disaster prevention has issued a yellow alert, meaning people need to prepare for a possible evacuation. Low and intermediate activity is expected to continue, and could possibly cause small amounts of ash to fall nearby. Popocatepetl, which translates to "smoky mountain" in Aztec, is the second highest volcano in North America and is Mexico's most active. The volcano has had more than 15 major eruptions since 1519. 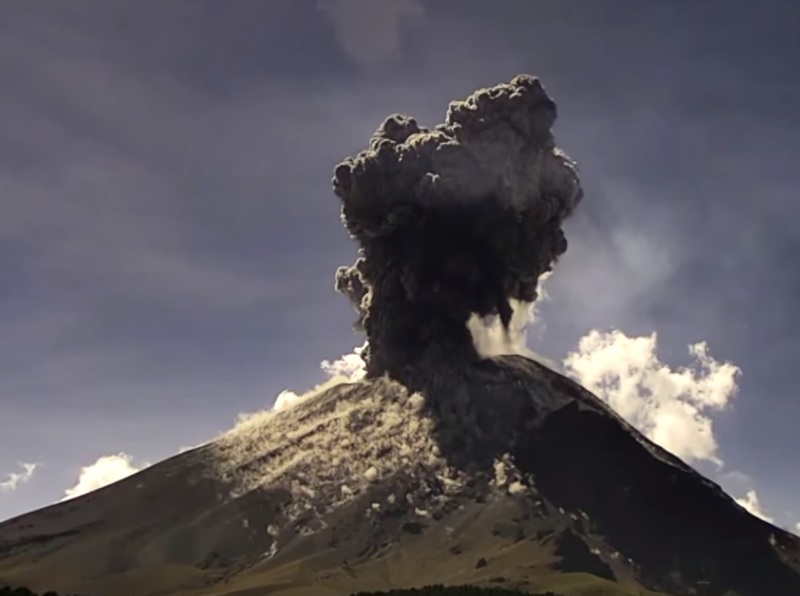 Popocatepetl is considered the most threatening on the continent because it can switch from a low-level eruption to the most powerful type quickly. These so-called Plinian eruptions are the highest category and tend to be caused by very thick lava that doesn't flow very easily. They include pyroclastic flows, a crushing wave of rock, lava, ash and gas, similar to that which buried Pompeii in AD 79. Popocatepetl hasn't had a Plinian eruption in more than a thousand years, but it has been erupting on and off since 2005. Scientists want to better understand how volcanoes like Popocatepetl can switch fro gentler eruptions to more deadly ones. In October last year thick rivers of mud washed into towns and villages in Mexico from the edge of Popocatepetl as locals feared it would erupt. Experts at the Sismologia Mundial geological news service reported the plume as a "mild eruption" and confirmed its status as "normal" shortly after.